The Kelso Cardigan features an allover horseshoe lace pattern with eyelet trim at the front and raglans. It is knit seamlessly from the bottom up, with body and sleeves worked in one piece from the yoke. The drape and stretch of lace gives the Kelso a close, flattering fit. The pattern includes detailed instructions for shaping in lace. If you're new to lace knitting, it will sound more confusing than it is! It all makes sense once you start knitting and becoming familiar with the lace repeats. I wrote the pattern at the request of several knitters who saw the original sweater on ravelry. Here's the post, with a couple more pictures, written before I knew I'd attempt a pattern. Thanks, ravelers, for motivating me to publish the pattern. Sweater is designed to fit with 0-3 inches negative ease. Cardigan pictured is worn with 3 inches negative ease. Finished measurements are after blocking, with sweater slightly stretched. Worsted weight yarn, approximately 590 (650, 690, 740, 788, 827, 876) yards or 540 (595, 631, 677, 721, 757, 802) meters. Use yarn with moderate elasticity, such as cotton and acrylic blends, cotton and wool blends, or wool. Sample shown is in Lion Brand Cotton-Ease, Lake (#110). US 6 / 4 mm 24 in. or longer circular needles for optional waist shaping. If necessary, change needle sizes to get gauge. 17 sts and 24 rws over 4 inches, in lace pattern after blocked. Click image for larger schematic. 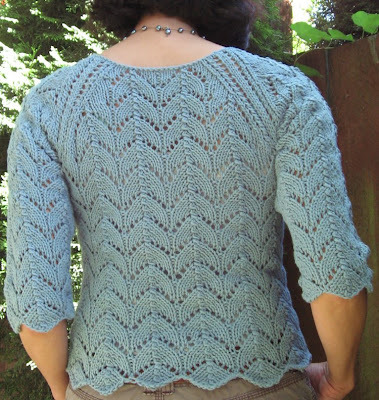 I paid for this pattern a few days ago via paypal, and today received a notification that my echeck had cleared. How do I go about accessing the pattern? Rachel, you should've received an email from Ravelry with a download link. If you didn't get that, I'll email you a copy of the pattern. Send your email address to frarydesigns at gmail dot com, or, in ravelry, to "beatknitter."